It’s got a claimed 310bhp (we saw 249.76bhp at the rear wheel on the dyno), a supercharger and can hit over 200mph with normal people like me and you riding it. Some will say the Kawasaki H2R's power is too much, it’s too fast, too expensive, too vicious, and yes – it’s all those things, but who cares? I wouldn’t if I had £41k to spend on an H2R. Thank you Kawasaki for being so brave – you promised it would be nothing short of epic, and you delivered. What more is there to say? It’s the ultimate top trump card; the fastest, most powerful production bike ever, and it works. Beautifully. The H2R feels like a completely new different bike to its H2 road-bike sibling. It’s 22kg lighter than the H2, turns easier, holds its line better. The suspension is the same between the H2 and R but it has to deal with less weight and the settings are more suited to the track, firmer. I makes you feel like a GP rider; the noise, the speed, the power. It's insane and sublime in equal measure. 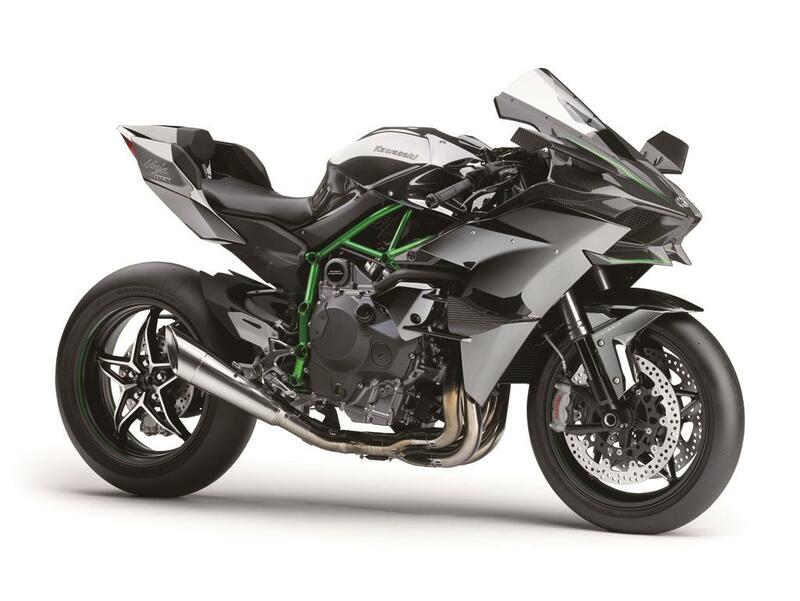 Surprisingly there isn’t a huge amount of difference between the two versions of the Kawasaki H2; both have the same bore and stroke, pistons and valves - even the same supercharger! The intake and exhaust systems are different, as are the ECU, the complete wiring loom, camshafts, tyres, head gasket, clutch, aerodynamic wings and carbon fibre bodywork. 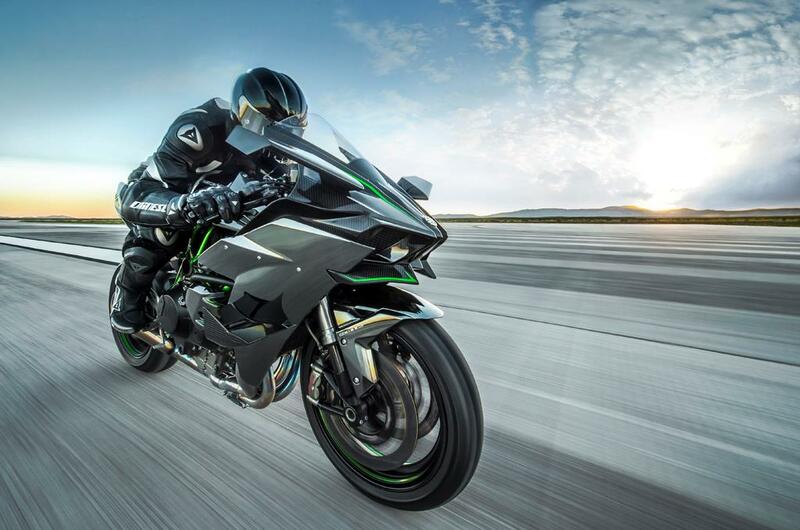 Kawasaki chose to use the most efficient of all blower types, a centrifugal supercharger, in which a spinning impeller rotates at phenomenal speed to shove air into a plenum chamber – or airbox to you and me ­– where all that velocity is converted into pressure. The importance of high efficiency is that power-robbing heat gain is minimal, and the H2’s high adiabatic efficiency means that it can be run without the need for a bulky and complicated intercooler, saving weight and space. Machined from a single forged block of aluminium using 5-axis CNC machining, the 69mm impeller has 6 blades at its tip and 12 blades at its base, all with grooves etched into the blade surfaces to help direct the airflow. The impeller’s pumping capacity at full speed is an incredible 200+ litres per second. The aluminium airbox has a six-litre capacity, and the pressure inside will increase to as much as 2.4 times atmospheric pressure, which is why it’s not the usual plastic construction. The aluminum is also claimed to act as a radiator for the pressurised air, keeping it as cool as possible before it enters the intake port. All that pressure has to go somewhere when you shut the throttle, which is why you can hear the H2 squeaking during gearshits, or as the throttle is closed. This the airbox pressure relief valve venting. Psssh. The supercharger is driven by a planetary gear train, which runs off the crankshaft, resulting in a very compact unit, with minimal power loss. The gear train increases the impeller speed to 9.2 times the crank speed via 1.15x step gear and 8x planetary gear. This means that at maximum engine speed on the H2R, circa 14,000rpm, the impeller shaft is spinning at almost 130,000rpm. The intake ports are polished to ensure smooth flow and minimise resistance, while the exhaust ports are straight, and don’t converge in the cylinder head, promoting faster gas flow. The high-lift cams allow fast gas exchange, while a wide overlap means intake air is used to help purge the exhaust gases. The combustion chamber employs a flat piston crown to help prevent engine knock. The intake valves are stainless steel, but the exhaust valves needed to be able to handle the supercharged engine’s high-temperature exhaust gases, so comprise an inconel head fricton-welded to a steel stem. The pistons are also cast rather than forged to offer better heat management properties. The naysayers, mainly other motorcycle manufacturers, claimed Kawasaki had dropped the ball by omitting an intercooler. It’ll never work they said. Well, it does. As well as their supercharger being inherently heat efficient, Kawasaki have done everything they can to keep the engine temperature low. The chassis design, lack of lower fairings, water-cooled oil cooler, and large coolant passageways all dump heat fast. The water jacket even extends between the twin exhaust ports of each cylinder, and around the spark plug holes to whip heat away. To facilitate smooth, fast shifting, the H2s use a dog-ring type transmission, developed with feedback from the Kawasaki Racing Team. Unlike a standard gearbox in which shift forks slide the gears into position, with a dog-ring transmission the gears all stay in place, and the dog rings slide into position to engage the desired gear. It makes for a lighter, smoother, and stronger gearbox. The Ninja H2R makes even the stock H2 look sensible. This is the most extreme production bike you can buy, and at £41,000, it ain't cheap. It will need meticulous servicing, and if you're keen on feeling the full force of the stunning acceleration, you better ringfence a good tyre budget, too. The Bridgestone slicks won't last many trackdays. The H2R has a similar service check interval to a competition motocross bike; every 15 hours ridden at over 8000rpm, or around 10 trackdays. At 15 hours the bike needs a service and tolerance check, at 30 hours it will need a full service. On the bright side, the level of finish and quality is exceptional, and it’s already an iconic machine. Its specialness isn’t going to fade – it's an instant collector's dream purchase. There’s no need to fear the supercharger for fast getaways, as the H2’s launch control will prevent wheel spin and minimise wheelies off the line. Riders can choose from three modes, each offering a progressively greater level of intrusion. Simply hold the throttle wide open, and let the clutch out. KLCM can be used concurrently with KTRC. 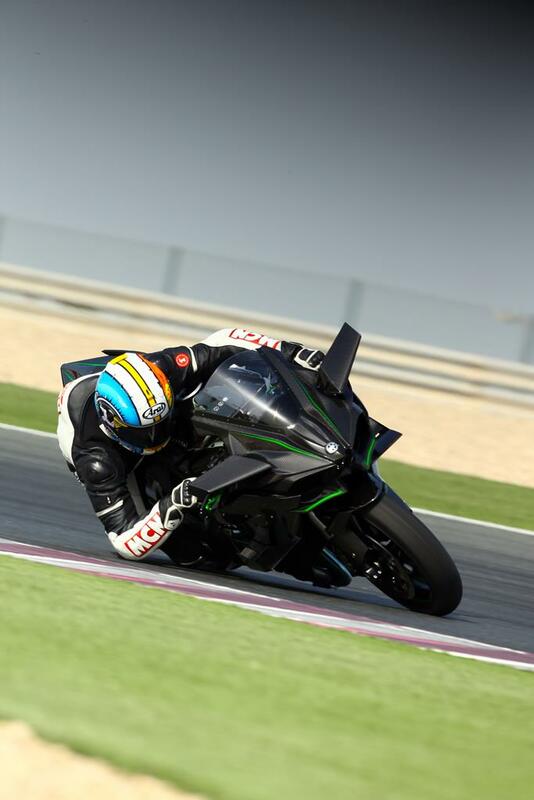 Launched in 2015, the Kawasaki H2R has undergone only minor tweaks to its frame colour. In 2015, it was green, before changing to grey in 2016. This was then swapped back to green in 2017, where it has remained. In 2018, Kawasaki launched the H2 SX. A supercharged mile-munching tourer, it offers blistering pace, alongside comfort and practicality. While the Ninja H2R is a track-only model, there is a significantly cheaper, and less exotic (while no less bonkers) Ninja H2 road bike. 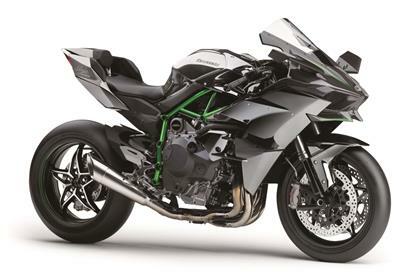 No owners have yet reviewed the KAWASAKI NINJA H2R (2015-on).